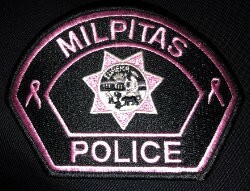 The Milpitas Police Officers' Association will be participating in the Pink Patch Project this October. The Pink Patch Project is a collaborative effort between several public safety agencies. These agencies have partnered together to combat breast cancer by raising public awareness and to raise funds for breast cancer research and treatment.